An appreciative audience was on hand for our birthday tribute to Harold Lloyd (born April 20, 1893) held at the Wilton Town Hall Theatre in Wilton, N.H. on Sunday, April 25. Also on hand was photographer Joanna Rieke, who had the challenging assignment of capturing the shadowy world of silent film accompaniment. She came up with some great and unusual stuff, and I've included a few of her images in this post. In 'Grandma's Boy,' music can really add something, I think, when the film's tone shifts from parlor antics to scenes of the manhunt, and I was happy with how this turned out: as the sheriff (Noah Young, for once not playing a dunce) recounted the events in the flashback, the music deepened and darkened, so when we come back to present, the stakes are that much higher, which not only heightens the comedy, but sets the stage for Harold's transformation. In his book "The Silent Clowns," Walter Kerr described Lloyd as an "architect of sympathy," and I see what he meant: everything in this films plays a role in getting us to root for Lloyd. By the way, people often rag on the old "Time-Life" versions of Harold's films that were shown on TV in the 1970s (when I first got to see them), but I remember being impressed with sequences such as when the dam money is discovered missing in 'The Kid Brother,' and how the ominous music helped signal how things had changed. Suddenly things get serious, and music can really help communicate that extra layer of tension. I also know what Kerr meant when he remarked on Lloyd's use of the "double climax." When Lloyd snaps the cuffs on the tramp, our audience broke out in cheers and applause, as if that was what the film was aiming for, and it sure seemed so at the time. But actually, a lot more was in store, and the result of Lloyd's structure heightened reaction to all the ups and downs that followed. Lloyd's instincts in telling a story on film were sure enough to hold an audience and deliver big laughs nine decades later. I've done this film before (we run it a lot because it's one of the few Lloyd features in the public domain), but in the past I've always used themes borrowed from other pictures I've done. This time, however, I was able to come up with all original material, including a jaunty "main theme" in 4/4 that worked well for all the small town action, but was transformable into something much more dynamic for the darker "tramp is on the loose" sequences. I also had a "hope" melody that helped set the mood for grandma's eventual role in Harold's transformation, and a weird chord signature for when the Zuni charm made its appearances. If you know the film, then you know a key musical sequence happens when Mildred Davis serenades Harold on the parlor organ. A brief glimpse of the sheet music shows the tune to be "You Are the Ideal of My Dreams," but the only lyrics that Mildred is quoted actually belting out are from the chorus: "I love you, I love you, I LOVE YOU!!!" For this, I came up with a 3/4 tune that sounded to me like it would fit those words, and guess what? The original tune by Herbert Ingraham from 1910 turned out to be almost exactly the same! It's such a classic that I'm sure it worked its way into my subconscious somehow, but how interesting that we came up with virtually the same melody and harmony for those key words exactly 100 years apart. Rather than quote the whole ballad, I engaged in a little dramatic compression, extending the "love you" melody into a self-contained 16-bar tune that cycles around in different keys as Harold deals with kittens licking his shoes. And, happily, this tune was versatile enough, I thought, to be played uptempo in 2/4 for the opening titles, and also in a dramatic "this is it" way to underscore Harold's sudden actions at the end, with the playout fitting perfectly with the amusing final fadeout. In terms of setting the scene beforehand, the only thing I told the audience was that they had to do the usual "time-shifting" in order to understand what Harold was getting at with the Civil War suit, which would have been the equivalent of wearing your grandfather's 1940s zoot suit today. (Which actually might be cool. How would I know?) But afterwards, a woman asked me about the reason for knocking the piece of wood off Harold's shoulder. I thought the "chip on your shoulder" metaphor would still be commonly understood, but guess not. Time passes. 'Grandma's Boy' somehow doesn't seem to make it on the list of Harold's all-time great pictures, but the more we screen it, the more respect I have for it. First, it NEVER FAILS to get a reaction, even when we screened it last fall to a total of 12 people at the historic Colonial Theatre in Keene, N.H. Also, there's a lot to this film that only repeated viewings have revealed to me. (Yes, I'm slow on the uptake.) For instance: the Civil War flashback has Harold's grandfather dodging cannonfire by energetically zigzagging back and forth; later, the same method is used by Harold to avoid the tramp's gunfire, but you barely notice it before the film moves on to something else. All in all, a remarkable film and great audience experience. Happy birthday, Harold! The thing about this film that always gets mentioned is how von Stroheim's original cut was something like eight hours long, prompting a battle with MGM in which the studio eventually took the film away from him and released it in much shorter form. The version we're showing is the 140-minute cut that was issued on laser disc some years ago. Surprisingly, the film isn't available in DVD format, as it's one picture that everyone agrees is a masterpiece of the silent drama, even in its truncated form. (And perhaps maybe because it was edited down to a more concentrated presentation.) Either way, I'm excited because it's one of the most-requested titles we've had, and dramas seem to lend themselves to music really helping pull it all together to create a state of intense emotion in a live performance. We'll see. We're showing 'Greed' on Monday, May 10 at 7 p.m. at the Palace Theatre, 80 Hanover St., Manchester, N.H.. Tickets are $8 per person. Box office: (603) 668-5588, or visit the Palace Theatre online to buy tickets online. I had the pleasure of doing music for a screening of the restored film 'When Lincoln Paid' (1913) on Tuesday, April 20 at Keene State College. A print of this rare Francis Ford film was found in a barn in Nelson, N.H., and so pre-screening publicity was aided quite a bit when the Associated Press picked up a story about it. Interest was intense enough for KSC film professor Larry Benaquist to move the screening from the college's Putnam Arts Center to a much larger auditorium in the new student center. That's Larry Benaquist at the podium making a few remarks prior to the screening. The musician would be sitting at the keyboard, but he was busy taking pictures. It was a real pleasure to work with Larry, who is retiring later this year after being a fixture at Keene State College for decades. He's done a lot to promote film and cinema in this part of the world, with this restoration of 'When Lincoln Paid' only the most recent example. The screening went well, especially because a slide show of stills and clips from other Francis Ford films was cycling through prior to the program. I wound up improvising accompaniment for it, which gave me a chance to settle in and warm up in advance of plunging into the actual film. 'When Lincoln Paid' is only about two reels and involves a lot of rapid shifts of time and tone and some dramatic action, too, and it's hard to get into "the zone" in that short amount of time. So the preview was a lucky break. I only had a couple of days to work up music for the film, so most of what I used was borrowed from earlier efforts: a little 'Tol'able David' here, a little 'The Wind' there. Started small with just woodwind settings and plain Aaron-Copland sounding country melodies on open fifths; then, as the action intensified, introduced percussion and other layers. Finally, let loose with everything during the surprisingly ambitious battle sequences. Tried to avoid too many obvious melody insertions, but did find myself using the tune of 'Yankee Doodle' in the bass, played slowly and in a minor key underneath arpeggios and repeated notes in the right hand above it, which actually sounds pretty ominous. And a few quotes from 'When Johnny Comes Marching Home' were enough to set the mood without hitting people over the head with it again and again. The film received an extended ovation, which was really nice to hear. Larry, who took a chance on me with little notice, was thrilled, and he generously said afterwards that the music "quadrupled the emotional impact of the film." High praise from someone whose opinion I greatly respect. Afterwards, we trooped over to the Putnam theater to see the restored material projected on actual 35mm film. A smaller group attended this screening, which was interesting and very worthwhile, as, after all, it's film we're talking about here. Unfortunately, the piano was a small upright with very tough action and tinny sound, and wasn't really in tune, either, so the music wound up being very "Dudley Do-Right"-ish. Also, the theater is beautiful, but has padded seating and carpeting over most the surfaces, so the sound from an acoustic piano really gets swallowed up whole. We're screening a Harold Lloyd program at our next Wilton Town Hall silent film series on Sunday, April 25 at 4:30 p.m. Here's the press release and some images. We've been getting full houses at the Wilton series and there's no better way to see a Harold Lloyd film than in a packed theater with a lively audience. 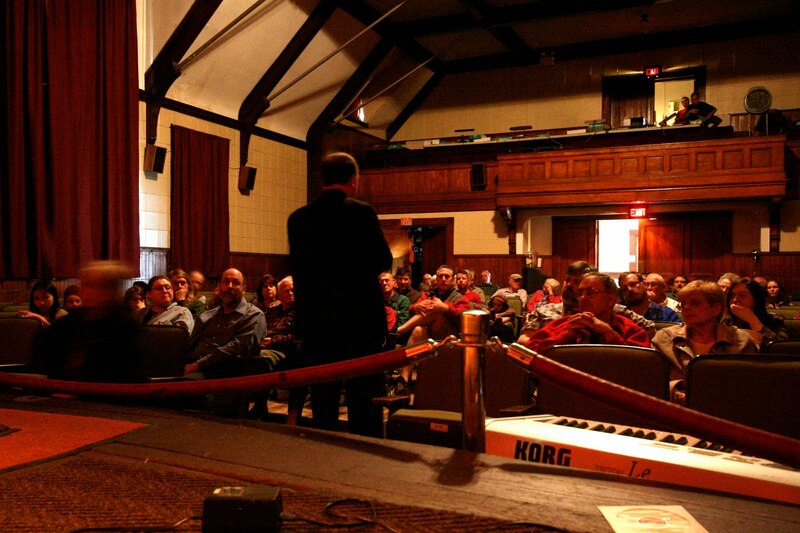 WILTON, N.H. - See for yourself why audiences first fell in love with the movies! 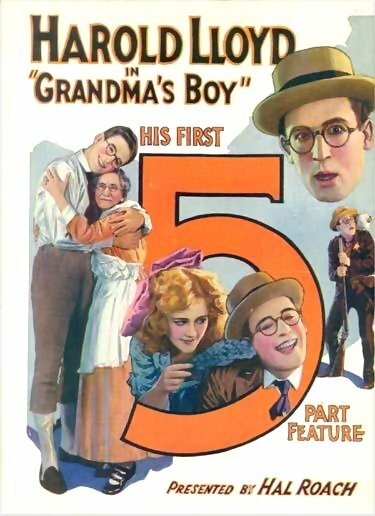 'Grandma's Boy,' a hit comedy that helped establish Harold Lloyd as the biggest box office star of the silent film era, will be shown with live music on Sunday, April 25 at the Wilton Town Hall Theatre, Main St., Wilton, N.H.
'Grandma's Boy' follows a cowardly young man who must find the courage to battle a menacing tramp terrorizing his small hometown, and also to win the girl of his dreams. 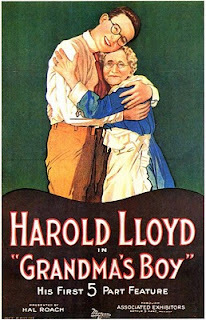 Audiences have enjoyed this classic story since 'Grandma's Boy' was first released in 1922, establishing Lloyd as a major star of the new film medium. 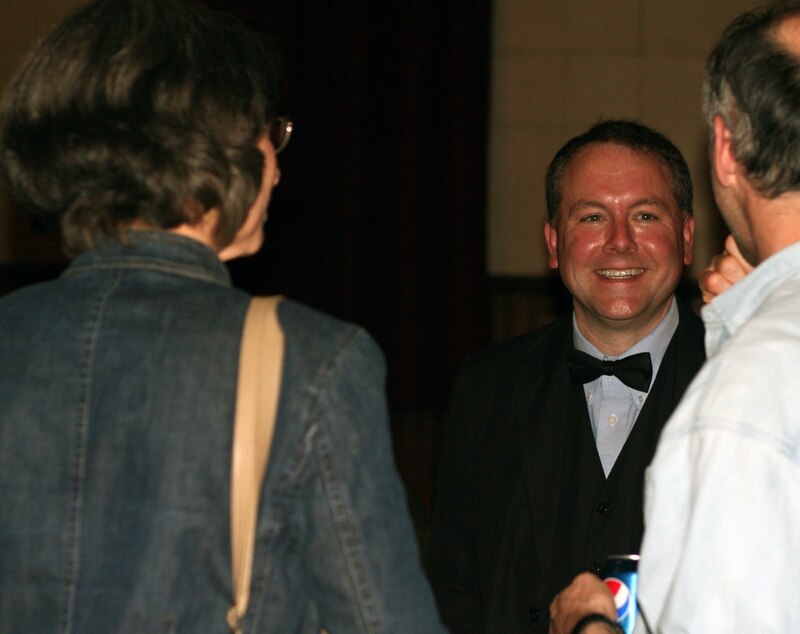 In revival, it continues to delight movie-goers and serves as a great introduction to the magic of silent film. 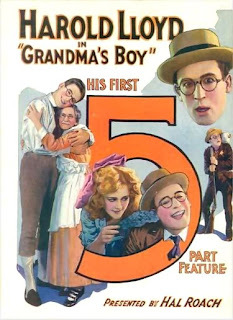 'Grandma's Boy' will be preceded by several short comedies also starring Harold Lloyd, tracing his development from a young actor trying to break into pictures into one of Hollywood's biggest stars. The films will be shown on the big screen from digitally remastered original materials, ensuring the best possible picture quality. The films will be accompanied by a score performed live by local composer Jeff Rapsis. "People today know about Charlie Chaplin, who was in a class by himself," Rapsis said. "But in the 1920s, Chaplin was releasing a picture only every few years. But Lloyd was releasing one film after another, all of which were immensely popular not just in the United States, but around the globe." Lloyd's career declined following the arrival of talkies in the 1930s. After retiring from the screen in 1938, Lloyd kept close control over his work, rarely authorizing revivals and not allowing the films to be shown on television, which meant later generations could not see his best work. He died in 1971. With the release of Lloyd's work on DVD in 2003, audiences are rediscovering Lloyd's timeless genius. The DVD reissue sparked a demand for screenings in theaters, where the Lloyd films continue to cast their spell on audiences. Shown in a theater with live music, Lloyd's features maintain their power to delight movie-goers. "Times have changed, but people haven't," Rapsis said. "The Lloyd films were designed to appeal to a worldwide audience, and their universal themes haven't lost any power. 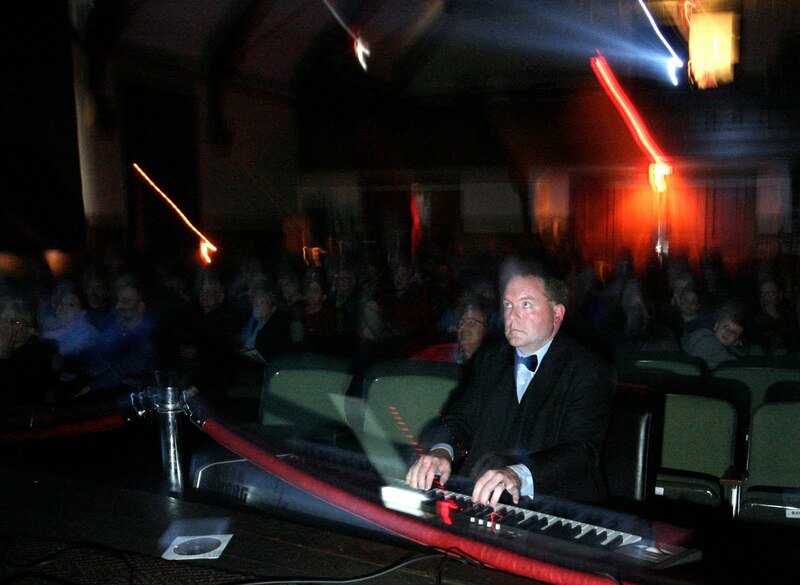 Shown under the right conditions—in a real theater with live music—they continue to work magic with audiences," said Rapsis, a New Hampshire-based accompanist who has performed music for silent films in venues ranging the Donnell Library in New York City to the Kansas Silent Film Festival. 'Grandma's Boy' is the latest feature in the Wilton Town Hall Theatre's regular schedule of silent films, which are screened on the last Sunday of each month. Admission is free, although donations are accepted to defray costs. "All of these films were designed to be seen in theaters by large audiences, not on a small television screen by people sitting at home," Rapsis said. "We aim to recreate the lost magic of early cinema comedy by bringing together crucial elements for its success—the best available prints, projection on the big screen, a live audience, and live music." 'Grandma's Boy' will be shown on Sunday, April 25 at 4:30 p.m. at the Wilton Town Hall Theatre, Main Street, Wilton, N.H.; (603) 654-3456, www.wiltontownhalltheatre.com. Free admission, donations accepted. Got word last night from New York accompanist Ben Model of an event in my own backyard that I didn't know about: the premiere next week at Keene (N.H.) State College of a recently rediscovered 1913 drama directed by and starring Francis Ford, older brother of legendary filmmaker John Ford. The print of 'When Lincoln Paid' was found a few years ago by a contractor tearing down a barn in Nelson, N.H., a tiny rural town in southwest New Hampshire. Now, after a lot of restoration work, the film is once again ready for the big screen, and a showing was set for next week at the college. 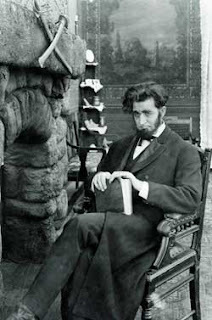 Below, I've posted a still from the film showing the director in the role of Abraham Lincoln; you can read more in this post from Keene State. I had no idea all this was happening, so I got in touch with Larry Benaquist, longtime film guru at Keene State, which is only about an hour from where I live. Larry got right back to me this morning; it turned out they were planning to use recorded piano music for the screenings but he was open to me helping out. I was grateful for the chance to contribute some live music, as it can really make a difference in a silent film's presentation and impact. Larry's mailing me a DVD of the film so I can get a look at it beforehand; we'll go with either the house piano (if it's up to it) or the digital synthesizer, which I'll lug along in case it's needed. It's utterly amazing to me that something as fragile as nitrate film can survive any time at all in a New Hampshire barn, never mind decades and decades. But it happens. Two years ago, Dennis Markaverich of the Wilton Town Hall Theater brought down an old metal box for archivist Dave Stevenson to examine. It turned out to contain a completely intact nitrate release print of 'The Wishing Seat,' a heretofore lost 1913 one-reel drama directed by Allan Dwan. So things keep turning up, which means there's at least a little hope for that missing last reel of 'Paths to Paradise' (1925), my favorite Raymond Griffith comedy. Fun screening this afternoon in my hometown library (in Bedford, N.H.) as part of a monthly music series they run. Unusual in that it was also the annual meeting of the Friends of the Library, and since I was set up and ready to go, I couldn't resist punctuating the usual business meeting activity with a little musical support: fanfares for motions passed, etc. As I just didn't have it in me to accompany a full-length feature on that instrument, I scooted home just prior to the show and fetched my Korg synthesizer/speaker setup and lugged it over for "Steamboat Bill, Jr." As for the score, it took awhile to get into the zone on this one, but some sequences went very well, especially once Buster and Ernest Torrence got on screen together. Alas, it's one of those spaces that absorbs the sound, with a suspended ceiling and wall-to-wall carpeting and such, and so there was no reverb and the music from both piano and synth sounded quite muffled, I thought. Audience reaction was a little less than usual, and I'm not sure why. The print looked good to me, but one audience member said afterwards that he couldn't tell that the last guy rescued by Keaton was a minister, so maybe...but this mystery is one of the interesting things about live performance. 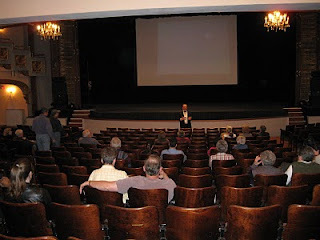 Our screening of "The Seahawk" last night (Monday, April 5, 2010) at the Palace Theatre in Manchester, N.H. went pretty well. Turnout was a bit light, but enough people were on hand to provide the live audience boost that's an essential part of the silent film experience, I think. There's a picture below of me talking to the pre-show crowd. We generally use DVDs and a high-lumen nuclear-powered projector for the Palace screenings, which fills the screen with a bright, sharp image. The only issue we run into is source quality, and in this case, our DVD of "The Seahawk" was good (it's one of the Warner Archives DVD-R releases), but it began unexpectedly catching just after the film's halfway point. Every few seconds, the frame rate would slow to a crawl, then speed up again. Dave Stevenson (acting as projectionist) tried pausing the disc to snap it out of this behavior, but it continued to do it for a good 15 minutes, and was a real distraction, I thought. Thankfully, the issue cleared up on its own, and afterwards I was surprised to hear from some audience members that they didn't notice. Musically, I'd give it a B. I was in the zone for much of the film, and the few melodies and chord signatures I'd developed provided plenty of material to develop a score on the fly. We had a heroic "on the high seas" theme, a love theme, and a forboding pattern, all of which could be transformed pretty easily, depending on the picture's flow. A harpsichord patch I rarely use came in handy to establish the aristocratic atmosphere of the scenes in Elizabethan England. One missed opportunity was in the last Algiers scene, when I had planned to use a dramatic synthesizer patch that includes a lot of exotic clanging bell sounds, but I completely forgot to switch over until it was too far into the scene. Sometimes you wind up with a wrong setting and you just have to deal with it, because changing in mid-scene can be jarring sometimes, which detracts from the film. Another highlight was meeting a volunteer usher who recalled attending silent films during his childhood in Bucharest, Romania in the early 1930s. We get a healthy contingent of volunteers at all our Palace screenings, and this was one I hadn't met before; unfortunately, we didn't get a chance much before it was showtime. I hope to catch up with him again at a future screening, as it's becoming increasingly rare to encounter people who experienced the silent era directly. But you never know who might turn up at our screenings: last year, a woman attending a screening of Chaplin's great film 'The Kid' (1921) claimed that as a boy, her father worked as child actor Jackie Coogan's stunt double in the film! At a screening of 'Wings,' (1927) a while back, a woman who attended was the daughter of a biplane pilot who as a young man trained all the other pilots for the movie, and played one of the German aviators. She'd heard about the film her whole live but had never had a chance to see it, and so was visibly moved to finally take it in. It's hard not to be moved by that picture. The projector, by the way, is borrowed for these screenings from Bill Millios and Jim McCracken, two New Hampshire-based filmmakers with whom I had the pleasure of working with a few years ago on "Dangerous Crosswinds," an independent feature film for which I wrote the music. These guys have been beyond generous to let us use this piece of equipment, and I want to thank them for their support. Check out their Web sites at www.backlotfilm.com and www.lunchboxfilms.com. Here's some info on tonight's screening of 'The Seahawk' at the historic Palace Theatre in Manchester, N.H. The program will include two short silent films recently reissued on DVD by my colleague Dave Stevenson. First up, in honor of everyone's favorite looming April 15 deadline, is a short animated cartoon from 1920 called 'A Tax From The Rear,' directed by Walter Lantz, who later went on to create Woody Woodpecker. This short was among about two dozen animated films from the silent era that Dave collected in reissued on a DVD called 'The Animators,' for which I had the pleasure of improvising musical scores. 'Shanghaied Lovers' is interesting because until now, all circulated prints were incomplete, consisting of only the film's second reel. But Dave came across the long-missing first reel in, of all places, a kinescope recording of an early Howdy Doody television broadcast. Like many early kids' shows, liberal use of old comedy films was used to fill time, and on broadcast the film happened to be Langdon's 'Shanghaied Lovers.' The image quality leaves a bit to be desired, I think, but we're fortunate to have the complete film in any form after all these years. Congratulations to Dave for bringing this together. If you'd like to see more, visit his Web site at www.looserthanloose.com. And for the main attraction, we have 'The Sea Hawk' (1924), one of the great adventure films of the 1920s. I've been reading about this film for years but never had a chance to see it complete until preparing the music for this screening. It's a fun picture—one that lends itself to a dramatic approach for the score, so I've concocted a couple of "on the high seas" melodies to use in weaving it together during the performance. It also has exotic locales that range from Elizabethan England to Algiers, and I hope to bring out this atmosphere as well. In my opinion, it doesn't have quite the 'snap' of Douglas Fairbanks' 'The Black Pirate,' which came out a few years later and seems to be the quintessential silent-era pirate film, at least in terms of having all the cliches. We screened the Fairbanks film last January in Wilton, N.H. as part of a double-bill and it got a thunderous reaction, so I'm interested to see how 'The Seahawk' fares with an audience. Hope to see you at 'The Seahawk.' Screening is Monday, April 5 at 7 p.m. at the Palace Theatre, 80 Hanover St., Manchester, N.H. (603) 668-5588. At our screening of 'King of Kings' on Sunday, March 28 at the Wilton Town Hall Theatre in Wilton, N.H., I asked a photographer, Joanna Rieke, to come by and try taking some photos. It's a challenging assignment: a dark room with a lit up movie screen. She came up with some good shots before the show, when I take a few minutes to introduce the program, and "action" shots from when the film is running. She's planning to come back to our next Wilton screening on Sunday, April 25 to try some more, but here are a few images to give you an idea of what she came up with. 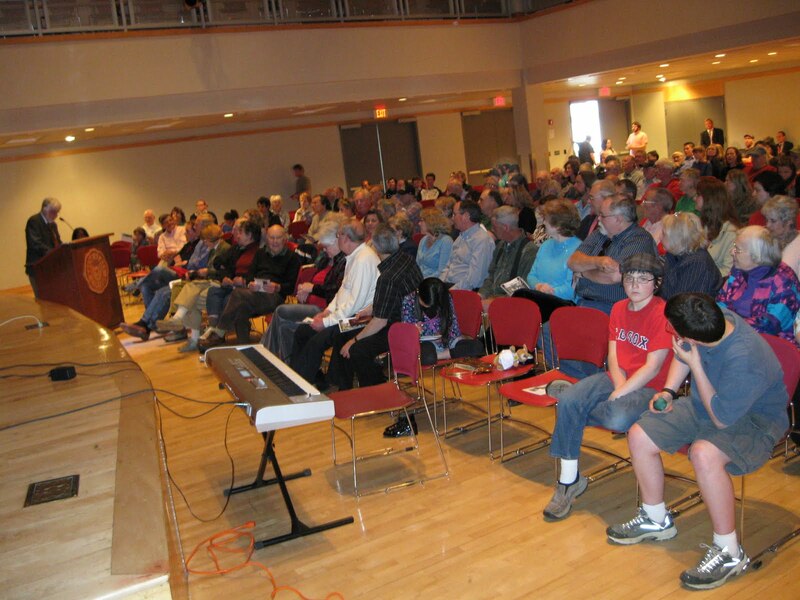 First, here's a shot of me warming up while the audience is getting settled. Movies have been shown in this location since 1912! Next is me doing the introduction. (Looks like I need to spend a little more time in the gym before bathing suit season.) The bow tie was for the camera, but also because it was 'King of Kings' and Palm Sunday, so it was the right thing to do. My big joke was to ask how many in the audience were Catholics, and then to say I'd "checked with the Diocese of Manchester, and this afternoon's screening does actually count as Mass." Follow-up comments about bread and wine/popcorn and soda pop and cinema being all about suspension of disbelief were less well received. Finally, here's an action shot. These kinds of photos are really tough to pull off and I think Joanna did a nice job. During longer films, I often enter a kind of trance that's similar, I think, to the state of "flow" that I've heard described by people who study the mind. While the film is on the screen and I'm at the keyboard, the rest of the world drops away, and this image seems to capture that. I look like I'm hypnotized, and I think I am, in a sort of self-governed way. Next up is 'The Seahawk' at the Palace Theatre in Manchester, N.H. on Monday, April 5 at 7 p.m. We have a couple of good short films planned for that screening as well, both restored and reissued by Dave Stevenson at Looser Than Loose Vintage Entertainment: a short animated film about income taxes (look out, here comes April 15!) that shows how some things just haven't changed at all since the 1920s; and Harry Langdon's sea-faring short comedy "Shanghaied Lovers," a two-reeler that Dave restored to completeness after finding much of the long-missing first reel included in a kinescope of an old Howdy Doody TV broadcast.